So you want to buy a radiator? 1 So you want to buy a radiator? 4 What’s the best radiator for my kitchen? 6 HOW DO I CHOOSE THE BEST RADIATOR FOR MY LIVING ROOM? 8 Which Bathroom Radiator Should I Buy? 10 Can I buy an Electric Radiator? In this UPDATED guide, we’ll give you the tools, the skills and the know-how to find the ideal radiator(s) for (pretty much) every room of your home. “That’s a bold statement!” I hear you cry. But this is BestHeating and nobody does radiators quite as we do. So stick the kettle on (or pour the vino), kick back and let’s find you the perfect radiator. Oh, and if what you really want is a heated towel rail, check our ultimate bathroom heating guide, instead. It’s safe to say that buying a radiator is a considered purchase. It’s not like buying a pair of socks or choosing a pack of chewing gum – it’s a pretty big deal and one that shouldn’t be taken lightly. We’ve published a few different guides on purchasing radiators before and we’ve looked into where we can improve even further to help you make the best choices – helping you to make an impressive change to your heating and even add value to your home. So in this latest guide, we’re going to look at every room, discover the best heating solution for every space and help you to transform your home heating into something more than just a thing that keeps you warm. From vertical designer radiators for your living room, to compact space-saving towel rails for your kitchen or en-suite, we’ll cover all of the bases, each of the rooms and every possibility – or at the very least give it a good go. We’ll start with understanding how to work out the size and heat output of the radiator you’ll need and look at calculating those all-important BTUs. But first, let’s see what our favourite interior design team have to say about choosing the right radiator for your space. Before I start getting all technical on you, just remember one thing – though it’s important to get correct, calculating your required heat output is easy. Of course, there are a few factors that can affect the amount of power you’ll need, such as room dimensions, levels of heat and types of window to name just a few. But if you have a tape measure and the ability to count, you’re pretty much golden on getting the perfect calculation. Check out this video for more info on BTUs. And now, let’s look at filling the rooms of your home with shiny new radiators and stuff – starting with the hub of every modern family home – the kitchen. What’s the best radiator for my kitchen? Kitchens have become the focal point of many a modern family home because they are not only designed for families to cook with one another but are equally as important for entertaining and bringing people together. Though usually the warmest room in the house – because of the oven and hob – you’ll still want to keep your kitchen heated in the winter when the temperature drops. Luckily for you, there are a huge number of options available that will add a touch of style and elegance to your space and still provide you with the warmth that you’ll need when the days start to get a little shorter. A small kitchen might not be the biggest heating challenge you’ll ever face, but finding somewhere for your rad to go – what with all the worktops, cupboards and appliances to contend with – can be quite difficult. A government study in 2010 put the average floor area of a UK kitchen at 11m², though a small proportion of them were less than 5m², meaning that there are a few VERY small kitchens out there. At 5m², when you factor in a fridge/freezer, cooker and other appliances – not to mention the food prep areas and the storage space you’ll need – that doesn’t leave much room for a radiator or a heated towel rail. Thankfully there are stylish, compact heating solutions available that will not only give you the heat that you need, but can help to add an impressive design touch to your space too – turning a once bland bit of warm metal into statement making piece of kit. Heated Towel Rails are becoming ever more popular in modern kitchens as they not only heat the space but – as the name suggests – they heat your towels too and the rise of vertical designer radiators has seen some amazing transformations in kitchens all over the UK. The perfect solution for heating a small kitchen space, this Milano Brook Anthracite heated towel rail is a simple and affordable way to add style and warmth to your space – and it’s less than £50! Designed to make a statement and get you and your kitchen noticed, this Black Milano Viti features a diamond panel design, is available in a wide range of sizes and outputs and features a gloss black finish that could make it the centrepiece of a small kitchen. As you would expect, a large kitchen will require a radiator with a much higher heat output than usual, but modern designs mean that you don’t need to look at an over-sized radiator to adequately heat the space. Newer radiators marry seamless functionality with intelligent design, so you can make the most of the styles on offer regardless of the size and shape of your kitchen space. 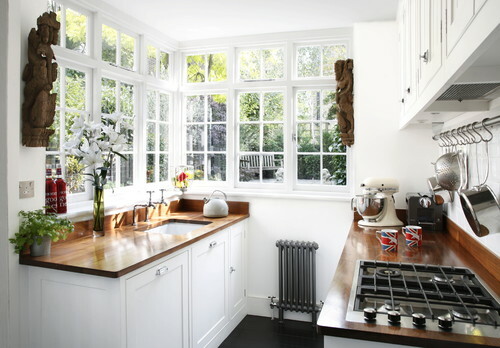 No matter how big or small, kitchens are unusual rooms to heat because you aren’t always going to need the radiators on in order to heat the room. For example, if you are cooking and the oven and hob are on, you’ll probably have enough heat to melt one of the icecaps if your radiator is on too; so it’s best to consider what kind of person you are – one that cooks, or one that doesn’t. If you do cook – and have the oven on regularly – it makes more sense to buy a radiator with a lower heat output. If you don’t know how to turn your oven on and are one of those “I don’t do cooking” types, it’s best to invest in a more powerfully charged radiator or towel rail – and if you fall somewhere in the middle, then there’s always TRVs. Thermostatic Radiator Valves sense the air temperature around them and regulate the flow of water through the radiator they are attached to. If you set them to the required temperature they will heat the room to that limit and then go no higher, perfect for both cooks and takeaway fans alike. A big HTR like this Milano Brook can provide enough warmth to adequately heat a larger kitchen and has the added bonus of keeping your dish towels warm and ready for use – there’s probably enough room to hang your hat too! Just as useful as they are in smaller spaces, an over-sized large vertical (or even horizontal) designer radiator such as this White Milano Aruba can make all the difference to how a room looks and feels. It’s important to consider how easy they will be to clean too. As you can see above, our customers are kind enough to send us some amazing images from time to time and there is nothing as satisfying as seeing one of our radiators in place and making all the difference to the look and feel of a space. Here are some pictures sent in by Graeme Barker of before and after the installation of his impressive Milano Java Vertical Designer Radiator – we think it makes all the difference in his beautiful new kitchen. Well done Graeme! HOW DO I CHOOSE THE BEST RADIATOR FOR MY LIVING ROOM? If you’re like the majority of people, most of the time you spend at home will be spent in the living room. From curling up in front of the gogglebox to having your Mum over for afternoon tea, whether you call it the living room, lounge or sitting room – unless it’s the height of British Summer Time – chances are you spend most of your leisure time there. Because of that fact, it’s only right that you’ll want the space to sing with style and panache and have a real sense of homeliness about it. And what better, more functional way is there to achieve a goal like that, than with a designer radiator? Vertical radiators make a big style statement regardless of the room you put them in. But in the sitting room, they are especially grand and bold and help to maximise space. History shows that old panel radiators were placed under windows in order to release heat into the room through natural convection – draughts from the window meeting with warm air from the rad which was then distributed throughout the space. Modern vertical radiators – particularly ones with much higher outputs – can adequately heat a space without having to ride on the back of any draught from a window. Not only that, but with most homes having double or even triple glazing these days, what little breeze there may have been is now virtually non-existent. The image above is a great example of how you can make the most of your available space with a vertical designer radiator. We stock a wide variety of radiators in this style and they are proving to be ever more popular up and down the UK. Here is a selection of Vertical Rads that are perfect for the living room – just click on any image for a little more info. Featuring an impressive heat output for such a slimline radiator, the vertical Milano Aruba offers the opportunity to make the most of your available space and add a touch of modern style and elegance to your space. Offering a more traditional slant on the modern vertical radiator design, the Milano Windsor is reminiscent of the old Victorian school house radiators of yore (I never thought I’d use the word yore) and helps to create a great contrast between more contemporary furnishings and your central heating. As I mentioned, the ‘normal’ done thing is to place radiators under the window and it may be that you want to stick with keeping them there. A wall with a window is considered dead space – as you can’t really put any furniture up against it without blocking the light from the window – and putting furniture up against a radiator is a big no-no too. Keeping your radiator right where it is and improving its style will mean you don’t have to spend extra cash on a plumber to move the pipework and you can put that cash towards getting a new and improved, more stylish and statement-making horizontal designer radiator. Though not as popular as the vertical styles, a horizontal radiator will help to add a sweet finishing touch to a space, is arguably easier to install (because of pipework remaining where it is) and will still add value to your property and look absolutely stunning. Check out these two from our extensive collection. I know it might seem that we keep on banging on about Milano radiators, but let’s be honest about it, the value and style of each and every one of them is second to none. With this horizontal Milano Aruba, it’s easy to replace your existing panel radiator with minimum fuss and transform your sitting room in no time. Another way to enhance your heating is with alternative Milano Aruba. Horizontal bars are a real departure from standard panel radiators, as they catch the eye and can be a real conversation starter. Our customer Celia James breathed a lungful of new life into her sitting room with this stunning parallel radiator from Hudson Reed. By installing a vertical designer radiator, Celia has really opened up the space, given herself enough room for a full-length mirror and transformed the room. Which Bathroom Radiator Should I Buy? In your bathroom you’re going to want to keep towels warm and dry and install a radiator or heated towel rail that ties in with the fixtures and fittings that you already have – or perhaps (if you’re a little bit ‘out there’) go for something that is a huge departure from the norm. Why not just go for a radiator and place a towel rail over the top, as was achieved with amazing levels of skill and style by our friend Charlotte at The Home That Made Me (see below). As with any other room, the size of your bathroom will dictate the kind of radiator you purchase, but there are a few other factors to bear in mind too. If you have a big family – but a small bathroom – and need to keep a large number of towels dry and ready for use, installing a HTR with some thermostatic valves could be the way forward. If you have a large family bathroom, then you may want to consider a bigger radiator and accessorise with some robe hooks or magnetic towel rails; that way, you can still get enough heat into the space while keeping things neat, tidy and dry. If what you require in your bathroom heating is a more traditional look and feel, then a Milano Trent may be the perfect heating package – there lots of different styles available out there too. An attractive and yet highly functional design, the Milano Pendle Heated Towel Rail with Shelf offers a high heat output and gives you storage for hand and bath towels alike. A great little solution for bathrooms in which storage can be an issue. As with the smaller design, this large Milano Pendle offers the user a shelf alongside more horizontal bars for added storage and a greater heat output. Perfect for a large family bathroom. For the really big family bathroom you can always buy a ladder! If you have a large family, require a large number of towels and really want to add a bit of modern style to your home, then the Tall White Milano Calder could be a great solution for you and your family. Don’t forget, you don’t have to install a towel rail in your bathroom if you don’t want to. There’s nothing wrong with pushing the boat out a little and investing in a sleek designer radiator – just like our customer Nic Tortice. Nic took the step of replacing the old panel radiator in her bathroom with a beautiful Horizontal Milano Capri, and we think the anthracite colour really enhances the look of her shiny new bathroom, don’t you? Can I buy an Electric Radiator? Electric Radiators are a great option for anybody that’s looking to heat a room that’s perhaps not being served by their gas central heating – I’m talking conservatories, extensions and even garden sheds! I discussed the rise of the electric radiator in last years buying guide and covered Economy 7 tariffs and how much it all costs. But in this year’s guide, I want to focus on designer electric rads and towel rails and how they can help to keep fuel costs down and add a sense of designer chic to a room. The beauty of an electric radiator is that they convert all of the energy they use into heat. They heat up quicker than their gas-powered counterparts – making them more efficient – and still have the amazing looks that you get with standard designer radiators. Taking their efficiency into consideration, all you have to worry about is the cost of the respective fuels – whether gas is cheaper than electricity or not – something that I covered in this blog earlier in the year. 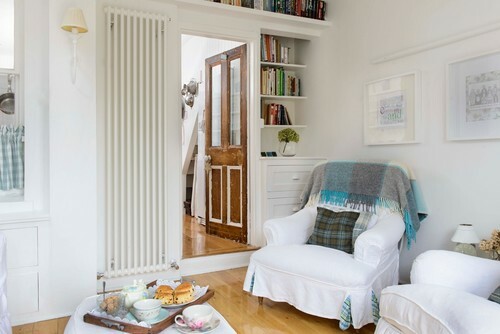 When all is said and done, an electric radiator is a convenient way of heating a room – you don’t have to worry about ripping up floorboards to lay pipework, so there are no expensive installation costs. You just need to decide where you want to put it, how large you need it to be and how great it’s going to look. To discover more about electric designer radiators check out the video below and take a look at our amazing range of electric home heating. For more hints and tips, loads of home heating advice and a range of special offers, deals and discounts why not sign up to our mailing list and pay us a visit on Facebook, Twitter & Google+. We’d love to hear your thoughts on how you heat your home and what radiator designs you’d like to see in next year’s buying guide – so make sure you get in touch. And if you’ve already bought your radiator, make sure you check out our range of videos on YouTube to discover how you can make the most of them and browse our Advice Centre for design tips, competitions and even more heating know-how. Till next time, Stay Safe and Happy Heating. We couldn’t let you get all the way through this guide without telling you all about the brand new Milano Capri coloured designer radiators. They have not long since landed in our store, so we thought we’d give this blog a quick update to include a link to them. They’re a great way to make a striking feature in any room of your home, so click the image above and go and check them out! Good luck in finding your next radiator. ← Our Top 7 Instagram Favourites! My radiator is over 25years old no air problem but is there a more efficient radiator boiler is a condensing 4 year old? Hi Angela, our friends at https://www.boilerguide.co.uk/ will be able to help you with that. Also, take a look at our guide on boilers here – http://www.bestheating.com/info/blog/the-improved-bestheating-guide-to-buying-a-new-boiler/ – 25 years is some going for a radiator! You must take really good care of it! Thanks for the reply John. I sent you a message, since you have such a good website and blog exploring the issues. The cost of the material still does not explain why these radiators are cheaper (and therefore more common) in other countries. The material is only one aspect – the shaping and transport is cheaper for example. Check the price in shops such as big DIY store Leroy Merlin in Spain or France, sites such as http://www.calometal.es or http://www.openclima.com/ http://www.iperceramica.it/it/ita/radiatori-alluminio-600-mm . Faral radiators are about 1/2 price in Italy. For a 1400W radiator the average price is about €100 , here it is about €200. Of course the ‘designer’ models (like the Milano ones you sell) are more expensive, but for the bog standard ‘tropical’-style model there is still a big difference. We are in the European Union, so there will be nothing like that (at the moment 🙁 we will soon be paying more import tax on everything). I think is the buying power of distributors when there is a big local market. Hi James, that would depend upon whether the material actually comes from the EU though. I can’t confirm where the aluminium comes from to make our radiators, unfortunately, but us being in the EU may have an effect – and obviously, we won’t know if there is any difference until we actually leave. It’s definitely something to bear in mind though…thanks. My radiators are 48yrs old but working fine. Are there more efficient rads around now or should I leave them alone? I’m about to start major renovations to the rear of the house and was thinks no of Vertical rads there. Are these as efficient and if so which are the most effective for a large room? Hey there, I would say: “if it’s not broken, don’t fix it!” – but if you were thinking of changing the aesthetic of your space, vertical could be a nice way to go, plus it can help you to maximise space. As for what is more effective in a space, that would all depend upon what level of heat output you may need. That will depend upon the dimensions of the room, what’s above and below, etc. Efficiency is a tough one though. Radiators all do the same thing (they get warm/hot), the larger they are, the hotter they’ll get, but if you were thinking about how long a radiator takes to get warm – and how much energy it uses to reach its optimum temperature – an aluminium radiator will get hotter 5 times faster than the steel alternatives. Will installing a curved towel radiator make an uneven wall appear straighter than it actually is? Well now Camille, that is a question, isn’t it? I would wager that there are a few optical tricks that you can play on the mind to make your wall appear straighter, but I couldn’t say yes or no as to whether a curved HTR would achieve that. I think a lot will depend greatly on the curve of the wall and the size of the HTR, but I couldn’t say with any certainty that it would help. I’m sorry.